The Oil and Fats business unit of Rusagro Group includes two separate areas: production of sauces and fats (fat plant) and production of vegetable oil (oil extraction plant). In both fields, the Rusagro Group holds leading positions in the market, and the products produced by the Oil and Fats unit are in demand both by Russian and foreign consumers. Following the results of 2017, Rusagro Group takes the 8th place in the sunflower processing market with a share of 4%. Rusagro Group is the largest Russian producer of consumer margarine and the fifth largest producer of mayonnaise according to the data of the Russian Union of Oils and Fats. In 2017, the Company continued to strengthen its position in the margarine market, increasing its share from 43 to 44%. In the mayonnaise market, the Group’s share was slightly decreased — from 12 to 10%. According to the AC Nielsen Retail Measurement Service in Russia as a whole, Rusagro is the 6th largest market share in the mayonnaise category (8.1%) * and the 3rd largest market share in the margarine category (16.8%) **; is the leader in the market share in the Urals: market share in the mayonnaise category — 54.2%*, in the margarine category — 74.6%**. -LLC Primorskaya Soya, Ussuriysk (RUSAGRO GROUP owns 75% share of the LLC Primorskaya Soya). Also, there are seven elevators for storage of sunflower seeds with a total capacity of 223 thousand tons within the subsidiaries. The Group’s sauce and fat production of is represented by OJSC Zhirovoy kombinat (Ekaterinburg Fat-processing Integrated Works) (EZhK). This integrated work makes the top five of the Russian largest industry-specific enterprises and dominates in the CIS market. Sunflower oil and meal of the Group is represented by the Oil Extraction Plant of CJSC Samaraagroprompererabotka (SAPP) located in the town of Bezenchuk, Samara Oblast. 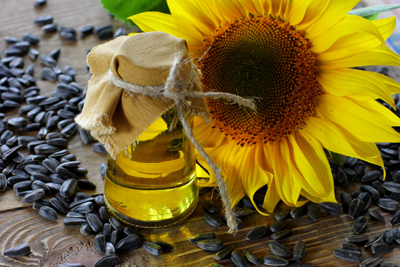 The plant makes the top ten of the largest producers and exporters of sunflower oil in Russia. LLC Primorskaya Soya manufactures soya oil, mayonnaise, soya oil meal — valuable protein supplement for farm animal and poultry feeds, product as a result of soybean seed oil extraction. It is also the only toilet and laundry soap manufacturer in the Russian Far East. In 2017 the Company processed 403 thousand tons of sunflower seeds and 110 thousand tons of soya. In 2017 the production of oil has grown by 19% — up to 192 thousand tons. In 2017 the production volume of oil and fats amounted to 111 thousand tons, including 56 thousand tons of mayonnaise, 40 thousand tons of margarine, spreads and industrial fats, and 7 thousand tons of packaged sunflower oil. In 2017, annual production of industrial fats was 3.4 thousand tons,and own bottled oil production was launched for the first time. Rusagro Group actively promotes its products for export. By the end of 2017, 37% of B2B products were sold for export. At the same time, 37% of the exported crude oil is sold in the countries of Central Asia and 13% in Egypt, and 91% of the exported sunflower meal is supplied to the countries of the European Union. In the consumer segment, the Company exports 40% of the volume, 75% of which is sold in the countries of Central Asia, 16% — in China.